Bryan Pollitt was born in Worsley, Lancashire, in 1918, writes Adrian Hughes. His father Frederick owned a company called Isaac Bury, who were dyers and bleachers to the world-famous Lancashire cotton industry. The family also owned a property, Bryn Eithin, in Deganwy’s Gannock Park. Bryan was educated at Radley College in Oxfordshire and after finishing his studies in 1935 sailed to Canada and America. On returning to the UK he went into the cotton business, working for English Sewing Cottons. 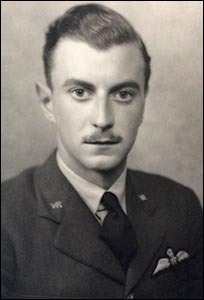 On the outbreak of war he immediately joined the ranks of the RAF, later being commissioned as a pilot officer in the RAFVR (Royal Air Force Volunteer Reserve). On 10 March 1941, Pilot Officer Pollitt took off from RAF MacMerry near Edinburgh on a routine patrol and in poor visibility flew his Hawker Hurricane into a hill south of Harperrigg Loch, Midlothian. The 22-year-old was buried at Corstorphine Hill Cemetery in Edinburgh a week after the crash. The obituary in the Radley College magazine stated that Bryan was “of a quiet and unassuming nature while at school” and was “one who easily made friends, and at the same time he showed early signs of that sense of duty which later led him to offer his services at once when war broke out”. Bryan’s sister Beryl was also in the RAF during the Second World War, serving as a Cyphers Officer.